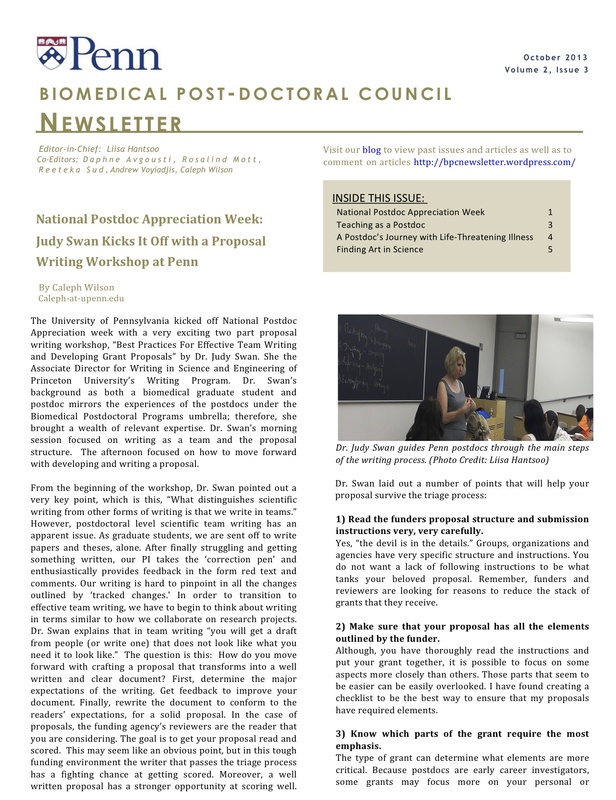 -Caleph Wilson covers National Postdoc Appreciation Week, with a special feature on Dr. Judy Swan’s writing workshop for postdocs. -Rosie Mott starts a two-part series looking at teaching in the postdoc experience. -Andrew Voyiadjis gives a first-hand account of dealing with serious illness during postdoc and how to cope. -Liisa Hantsoo interviews the postdoc winners of Penn’s “Art in Science” competition, and talks art and science. The University of Pennsylvania kicked off National Postdoc Appreciation week with a very exciting two part proposal writing workshop, “Best Practices For Effective Team Writing and Developing Grant Proposals” by Dr. Judy Swan. She the Associate Director for Writing in Science and Engineering of Princeton University’s Writing Program. Dr. Swan’s background as both a biomedical graduate student and postdoc mirrors the experiences of the postdocs under the Biomedical Postdoctoral Programs umbrella; therefore, she brought a wealth of relevant expertise. Dr. Swan’s morning session focused on writing as a team and the proposal structure. The afternoon focused on how to move forward with developing and writing a proposal. From the beginning of the workshop, Dr. Swan pointed out a very key point, which is this, “What distinguishes scientific writing from other forms of writing is that we write in teams.” However, postdoctoral level scientific team writing has an apparent issue. As graduate students, we are sent off to write papers and theses, alone. After finally struggling and getting something written, our PI takes the ‘correction pen’ and enthusiastically provides feedback in the form red text and comments. Our writing is hard to pin-point in all the changes outlined by ‘tracked changes.’ In order to transition to effective team writing, we have to begin to think about writing in terms similar to how we collaborate on research projects. Dr. Swan explains that in team writing “you will get a draft from people (or write one) that does not look like what you need it to look like.” The question is this: How do you move forward with crafting a proposal that transforms into a well written and clear document? First, determine the major expectations of the writing. Get feedback to improve your document. Finally, rewrite the document to conform to the readers’ expectations, for a solid proposal. In the case of proposals, the funding agency’s reviewers are the reader that you are considering. The goal is to get your proposal read and scored. This may seem like an obvious point, but in this tough funding environment the writer that passes the triage process has a fighting chance at getting scored. Moreover, a well written proposal has a stronger opportunity at scoring well. Dr. Swan laid out a number of points that will help your proposal survive the triage process. 1) Read the funders proposal structure and submission instructions very, very carefully. Yes, “the devil is in the details.” Groups, organizations and agencies have very specific structure and instructions. You do not want a lack of following instructions to be what tanks your beloved proposal. Remember, funders and reviewers are looking for reasons to reduce the stack of grants that they receive. 2) Make sure that your proposal has all the elements outlined by the funder. Although, you have thoroughly read the instructions and put your grant together, it is possible to focus on some aspects more closely than others. Those parts that seem to be easier can be easily overlooked. I have found creating a checklist to be the best way to ensure that my proposals have required elements. 3) Know which parts of the grant require the most emphasis. The type of grant can determine what elements are more critical. Because postdocs are early career investigators, some grants may focus more on your personal or leadership backgrounds. Others may need you to emphasize your science. Weight your proposal appropriately. 4) Be clear on the proposal review process. Developing projects and executing them is stressful enough. Try not to compound your stress by letting your imagination run wild! Be clear on the time frame of the review process and how it proceeds. Moreover, do not be afraid to follow up if the review process exceeds the timetable. Unforeseeable events happen. You need to know if you should be working on a resubmission, or submitting elsewhere. 5) Write in a way that allows your reviewer to be enthusiastic about your proposal. Enthusiasm should be the result of the rewriting that you and your team have done. An excited reviewer will likely give you a fundable score and fight for your proposal during a study section. Out of a stack of grants that a reviewer has slogged through, an easily readable and solid proposal is refreshing, according to Dr. Swan. Overall, getting some words on the page represents the best way to get your writing moving forward. Spend some time to refine your best practices. You have a writing rhythm. Find it and writing will become routine. Dr. Swan’s afternoon session highlighted the stages of writing. As you consider putting your proposal together, keep your process in mind. Dr. Swan mentioned this, “Writing is a physical process. What is your ritual?” For example, do you need to set aside a half-day block of time, play your favorite music and get a glass of your favorite beverage to get into your writing rhythm? As you morph into a writing superhero prepare yourself to move through the writing stages. That starts with giving yourself an adequate timeline to complete your proposal. Start with asking this question: How much time do I need to get this proposal written? The appropriate answer to this question is based on a realistic assessment of your skills and the scope of the proposal. Getting through following steps is key: 1) Pre-drafting, 2) Drafting, 3) Revising, and 4) Editing/Proofing. Pre-drafting entails everything that you do to get the background materials ready. This usually means a large and scattered pile of papers or files. What is the best way for you to manage moving through these materials? Organize them to in a way that keeps you on task. This is when you explore your ideas and develop an outline for a coherent proposal draft. After getting your thoughts and plan together begin writing. Revisit the key point of your proposal multiple times throughout the draft. The reviewer will know your point because you will keep reminding him or her. Analyzing what you have written is part of the revising process. Does your preliminary data support your aims? Do you need to do more experiments that are in line with your proposal? This is a good time to for the writing team of co-authors and contributors to review the proposal. Putting together the best proposal prior to the editing process is your aim. Editing is the time to eliminate unnecessary words and sentences. Start with having your editorial support review the proposal. Multiple editors can give you a fresh perspective on the document. They will be able to help you flesh out glaring issues with readability. During the drafting process you worked steadfastly to get your words on the page. Editors should go through your proposal sentence-by-sentence. Each sentence should support the point of the proposal. A final take home message: If you can get the reviewer to become and stay interested in your proposal, you will be off to a good start. Keep in mind that a well prepared, edited and written proposal is both necessary and sufficient to garnering enthusiastic support of your reviewer. As graduate students, many of us served as teaching assistants for a semester or two. Often, the bulk of our work was basic: grading homework sets and holding office hours. From time to time, the faculty would need us to lecture while they were traveling for a conference. Though it was many years ago, I still clearly remember my first lecturing experience. At the age of 24, I felt like a real instructor as I professed equations and concepts in physiology to the class of about forty undergraduates. It was easy to be well-prepared, as my advisor had given me all of his clear and detailed notes for the lecture. Nothing could have prepared me though, for that awkward feeling of two scores of students starting at me in silence. I had no idea if anyone was really ‘getting it’. My feeble attempt to make a connection was to periodically ask everyone “does this make sense?” The response was always a few half-hearted nods. Looking back, I was certainly not a real instructor at all. For the remaining years of my PhD and throughout my postdoc, it was and has been easy to gain experience in the other form of teaching: mentorship. Side-by-side at the bench, I easily work through research concepts with students. I know that they are getting it because they come back to me with data! As for working on my lectureship skills, I always feel too busy. I have no idea how tenure track faculty balance the research world with the teaching world, yet some of them do it phenomenally. Since classroom instruction is an integral part of the university, it is fundamental for academics to put aside some time to develop this skill. So what are the opportunities out there? Recently, I caught up with a postdoc, Amanda Zacharias, who with her co-organizer Jean Parry has developed The Education Journal Club. This journal club, meeting once per month, is a terrific opportunity to learn more about teaching from a research perspective. The forum is for those with and without experience to get together and discuss new teaching methods and effective strategies. The group frequently reviews articles from CBE – Life Sciences Education, a journal published by the American Society for Cell Biology. This journal is great for addressing methods specific to education in the biological fields, but also covers some more broadly applicable topics. For example, A. A. Levesque recently published on the use of clickers in developing genetics problem-solving skills . Yes, clickers. That’s new to me, and if it is new to you too, well, we really need to familiarize ourselves with the multitude of technologies added to the classroom in the past decade. Some faculty use video recordings of themselves to give the students a review of past lectures. Course websites are now universal and allow the students to submit their work and exchange information with one another. Zacharias notes to me that all of these are implemented with the goal of increasing student engagement, but are also active topics in research for their effectiveness. Another interesting development that Zacharias fills me in on is the concept of “realistic labs”. In the past, labs have been composed of very small and completely outlined tasks, bearing no resemblance to true research. There is now more of a focus on lab projects that span the entire semester, in order to give students a better feel for the ups and downs of true biomedical research and to facilitate better problem solving skills. Joining a group like the Education Journal Club is a great way to learn more about trends in teaching, but how do we gain more experience? Zacharias recommends that we offer to lecture for our postdoctoral advisor when he or she is travelling. Handling an entire course on our own as a postdoctoral researcher is probably not feasible. Zacharias notes “Someone once told me that an hour of lecture requires eight hours of preparation beforehand.” Though we could be lucky and find a teaching opportunity at Penn or another local university where the course materials have already been developed. There are many universities in the Philadelphia area that hire temporary instructors to cover for faculty on leave. For example, University of the Arts and University of the Sciences are close by. We can always reach out to them and let them know what we would love to teach. For a more developed experience, The NIH offers an Institutional Research and Academic Career Development Award. For Penn postdocs, the program is specifically known as Penn-PORT (Penn Postdoctoral Opportunities in Research and Training). It has a focus on minority-serving institutions in the area including Rutgers, Delaware Technical Community College and Lincoln University. It is a competitive program in which participants are funded for three years, part of which they spend exclusively teaching. So there you have it; there are many opportunities for us to develop our talent in teaching. We just need to find the time. In the coming months be on the lookout for a survey regarding your teaching experience. In the next edition of the BPC Newsletter, we will report on the statistics from the survey and provide more insight on what type of experience is critical in the job market. 1. Levesque, A.A., Using Clickers to Facilitate Development of Problem-Solving Skills. CBE-Life Sciences Education, 2011. 10(4): p. 406-417. It all started with a cough. Like any other day, I sat at my office hunched over my keyboard working when I felt an annoying tickle in my throat and I started to cough. I heard the voice of my co-worker over my shoulder, “You should get that checked out.” I didn’t think too much of it so I continued to work. And really, who has the time to think about being sick, especially when you’re spending half your day figuring out how to fix your research and the other half stressing over how much further along you should be? In most cases, a physician examining me would agree that my cough, given my health record and circumstances, was not life threatening. I’m sure some would even cite the old saying, “when you hear hoof beats, think of horses not zebras,” which means first consider the common ailment before the rare diagnosis. But just in case I decided to get a quick check-up, which slowly started to turned into a grueling 6-month fight against a life threatening illness. In the next couple of weeks I was uncertain and scared about what was wrong with me. After many tests it was determined that a tumor was pushing on my windpipe that was causing me to cough. When my doctor told me the news I freaked out. I mean, what 31-year-old goes into a doctor’s office with a cough and leaves thinking they may have cancer! No one thinks they are going to be that zebra. I certainly didn’t. Dealing with this while a postdoc was difficult, to say the least, and life changing, but I have grown so much from it. As you can expect, after hearing the news I had a million thoughts… “What does this mean? How could this be happening to me… This doesn’t make any sense I feel completely fine…” These thoughts circled over and over in my head making me feel dizzy. The only thing I could do to get a grip was look in the mirror and remind myself that this really is happening to me! On top of all these questions, I was soon going to learn about the other problems cancer patients have to deal with – drug side effects, managing relationships, trying to keep up with work responsibilities, etc… The combination of everything is so daunting that if someone told me I would have to deal with them before I went through them, I would have probably had a nervous breakdown, crawled into a hole, and prayed that all my worries would disappear. Thankfully I found ways of coping. The most important was finding out what makes me happy and doing it. This had never been more crucial to live day after day than at this point in my life. For me, it was watching a lot of comedy like Dave Chappell and exercising. Yes, exercising! Reminding myself that just because I was sick didn’t mean that I was dead. And so when I could exercise, I did. It helped reduce stress and release those lovely endorphins. Every little bit helped. As I started to organize my thoughts more questions started to come up, the most important of which was what type of cancer do I have and can it be beat? This was when the analytic part of my brain started to kick in and my problem solving skills and logic, as with most people, would provide some solace from my first paralyzing feeling. If all these emotions wreaking havoc in my head weren’t enough there were also those thoughts of “how am I going to pay for this…,” “when should I tell my boss…”, and “is he going to want to keep me on once he knows…” I couldn’t also help but think of my research that I’ve worked so hard on and is as much a part of me as this cancer. Fortunately I have a very considerate supervisor who not only allowed me to get my things in order after my surgery and treatment, but also let me continue my work from home, because my work is largely computer based. Working from home was a blessing since I wouldn’t have to worry about the possibility of infection from contact with others on my commute, let alone building my strength, which I didn’t have much of after many of my treatments. I can’t say enough about how important and helpful it was that my supervisor was so supportive during this whole process. I also tried to do my part and stayed in contact with him at least once a month to not only give updates on my medical condition, but also inform him on my research progress. This was also a good time to keep everyone in the lab up to date with my condition. The love and support I felt from my lab was unlike anything I had ever felt and it really raised my spirits. That, in and of itself, was a great reason to share my experience with my labmates. Additionally, I can’t stress enough how important it is to get in touch with the benefits program. Garnett-Powers & Associates were amazing in helping me navigate through confusing insurance protocols for changing treatments. In particular, Tom Garnett, the president of the company, personally helped me figure out what I needed to do to get proton therapy. This was because Aetna didn’t think it would make any difference if I received radiation instead of proton therapy, even though all my doctors said proton was my best option to limit the amount of radiation hitting my vital organs. The key to expediting the process was setting up a peer-to-peer review with doctors from Aetna and UPenn. I quickly learned after this that sometimes policy has a hard time catching up with technology, so make sure to do your research and get help from those who can modify policy. Furthermore, don’t forget that you are the patient and being kind and quick with the doctor without addressing all your own concerns does not guarantee better care. Quite the contrary if your concerns are not taken into account. So ask the hard questions. Because you don’t want any regrets, you want to know your options, and the more secure and in control you feel the less stress you will have. Ultimately, I’m grateful to everyone who helped no matter if it was just thinking about me or stopping by my apartment to play Dr. Mario on my Wii or drop off some more comedy DVDs. For any of my fellow postdocs who may be going through a difficult medical situation of their own, I want to advise that you should be ready to answer some “gut check” questions like “Do you have a living will and if not do you want one.” Everything aside, I know that I was fortunate to quickly set up an appointment with a specialist, be admitted into HUP that same day, and then on an operating table the next day, but I still felt like I was on a dizzying carnival ride. So if you are going through tough medical problems now, just hold on for the ride and keep moving forward because things will get better. Winners of the Penn “Art in Science” competition talk art, science, and how the two intertwine. Bright blue splotches overlay a cluster of reddish-black rounds. An abstract expressionist piece? Or human dendritic cells nucleofected with HIV-1 envelope? A recent exhibition at the Perelman School of Medicine pondered the parallels between the visual arts and scientific images. The exhibition images were part of the first annual “Art in Science” competition, sponsored by the Office of the Executive Vice Dean. The competition was open to Penn biomedical researchers, and the Office selected three postdoctoral and three graduate student winners. The Office stated that they received a multitude of “scientifically intriguing and aesthetically striking images” from the Penn scientific community. I interviewed our three postdoctoral winners to get their take on science, art, and how the two intertwine. 1st Place: “Skin mucosal immunoglobulins in fish: controlling the “alien” pathogens,” by Daniela Gómez Atria, Sunyer Lab. Dr. Gomez’s piece features a green facelike image, pointillated with purple and blue. While it resembles an alien countenance, the image is actually immunoglobulin T (IgT), an ancient mucosal immunoglobulin of fish, surrounding an Ichthyophthirius multifiliis trophont (a ciliated protozoan in its adult life stage) on the skin of an infected rainbow trout. 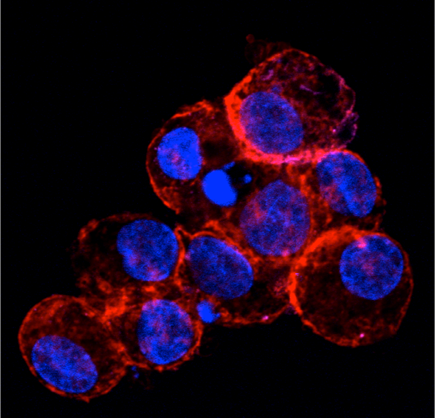 IgT is stained in green, the I. multifiliis trophont is stained in magenta, and epidermal cell nuclei are stained in blue. Gomez’s research was performed in the laboratory of Dr. Oriol Sunyer in the School of Veterinary Medicine. Their lab studies the immune system using the rainbow trout as a model. In this project, Gomez and colleagues wanted to examine the evolutionary origins of mucosal immune defenses in the skin, to show that adaptive immune responses in the skin of fish share common features with mammalian mucosal immune responses. The researchers showed that IgT, a fish immunoglobulin analogous to mammalian mucosal IgA, is present in the skin mucus of rainbow trout in a relatively high ratio compared to other immunoglobulins. Furthermore, 60% of the B cells isolated from the trout skin were IgT positive, and IgT was found covering a great percentage of skin bacteria, suggesting a key role in controlling skin microbiota. In studying the trout’s immune response against the skin parasite I. multifiliis, the researchers found that IgT positive B cells accumulated in the skin epidermis after infection, that IgT was the major parasite-specific immunoglubin in the skin mucus, and that IgT was able to cover I. multifiliis allocated in the skin epidermis (depicted in the image). Gomez states that altogether, this study suggested that mucosal immune responses in vertebrates are based in conserved primordial principles. 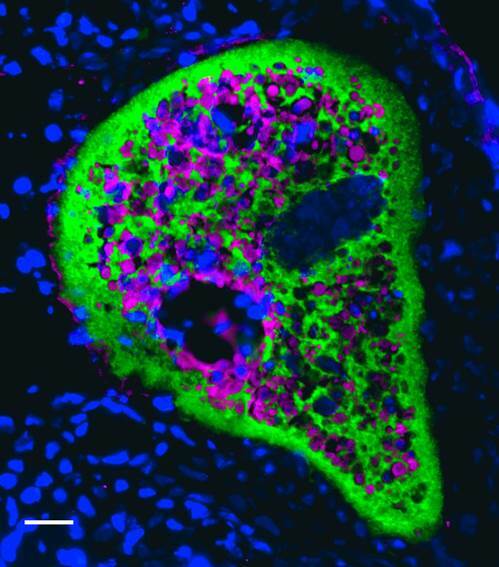 Gomez’s image is part of a series of images published in the paper “Teleost skin, an ancient mucosal surface that elicits gut-like immune responses (Xu, Parra, Gómez et al. 2013) in Proceedings of the National Academy of Sciences (PNAS). She is currently completing a second postdoc in Dr. Gudrun Debes’ laboratory, also at the vet school, to study immune responses in skin with mammalian models. 2nd place: “The characterization of 2,472 human orthologs of mouse essential genes in terms of their evolutionary and population genetics properties using data from recent deep sequencing initiatives in human populations,” by Benjamin Georgi, Bucan Lab. Dr. Georgi, a postdoctoral fellow in Dr. Maja Bucan’s lab in the Department of Genetics, focuses on bioinformatics. His image resulted from a study of the population genetic properties of essential genes in humans. Georgi explained that “Using a list of essential genes derived from mouse phenotyping data, we could show that these genes are subject to strong purifying selection in humans, and show a potential role in Autism spectrum disorder.” Georgi stated that the image he created incorporated an image of a mouse embryo originally taken by Staci Rakowiecki, who “very graciously” gave him permission to use it in the competition. 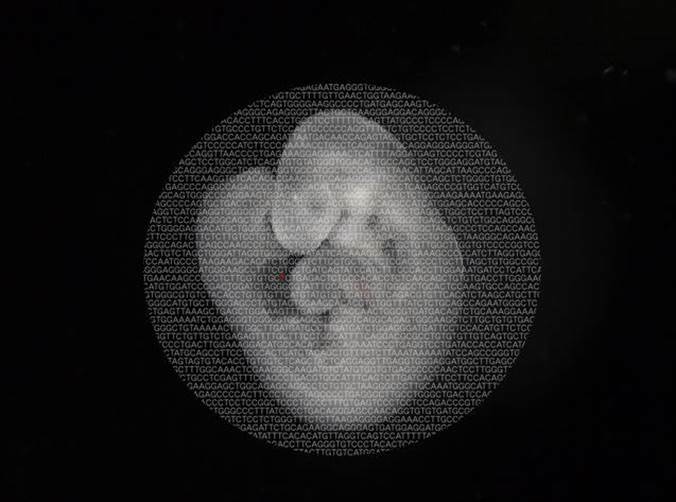 Georgi chose to superimpose a DNA sequence over the embryo to represent how the development of an organism is determined largely by its genetic code. The DNA sequence was taken from a calcium channel gene (CACNA1A) that is implicated in bipolar disorder, one of the research foci in Bucan’s lab. The image was meant to capture the overall idea of their study: to analyze genes that are essential in the mouse and to analyze the corresponding genes (orthologs) in humans. The red nucleotide in the middle is a mutation that impacts development. The image is associated with a recent article by Georgi in PloS Genetics (http://www.plosgenetics.org/article/info%3Adoi/10.1371/journal.pgen.1003484) that focused on the role of essential genes in human disease. 3rd place: “Human dendritic cells nucleofected with HIV-1 envelope,” by Angela Conde, Weissman Lab. Much like an artist’s painstaking and time-intensive process, scientists put a great deal of energy and technical skill into producing an image that conveys their scientific findings. Artists and scientists alike are attempting to convey some idea or premise to their audience. The best of science images not only convey a scientific result, but also are aesthetically striking. While most scientific images may be of particular interest to other scientists, when creatively done an image can be a great vehicle for garnering interest in scientific research in a broader audience. The full-sized images are on display in the Office of the Executive Vice Dean. Xu Z, Parra D, Gómez D, Salinas I, Zhang YA, von Gersdorff Jørgensen L, Heinecke RD, Buchmann K, Lapatra S, Sunyer JO. (2013). Teleost skin, an ancient mucosal surface that elicits gut-like immune responses. PNAS. 110(32): 13097–13102. (http://dx.doi.org/10.1073/pnas.1304319110).